It was the perfect example of connecting people, ideas and resources when Hamilton Community Foundation helped launch a program that trained out-of-work people in construction and gave downtown residents small exterior property renovations they could not otherwise afford. Last spring, HCF grants manager Sharon Charters learned about the need for a home renovation loans program and brought it to the Hamilton Funders network. There the idea was sparked to create a grants program, using provincial training money available for job seekers to do the work. Called the Neighbourhood Home Improvement Program, the partnership links job-readiness funding from the Ministry of Training, Colleges and Universities with the non-profit Threshold School of Building’s teaching expertise to help low-income homeowners. 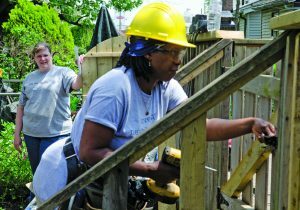 Windows installed, fences repaired, porches reinforced…by mid-September some 56 homeowners were assisted cost-free, often with repairs that improved safety. Job-ready individuals with new skills and experience who will be assisted to find sustainable work. Improved lower city properties, neighbourhood pride, and a group of very grateful participants.